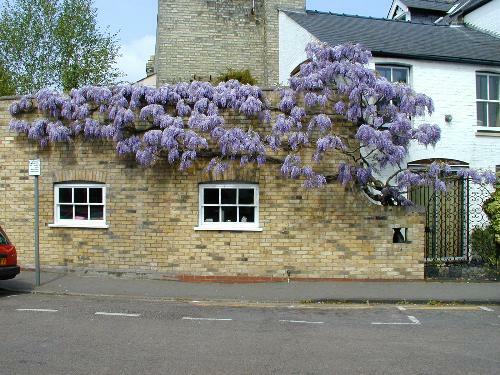 This Wisteria (Wisteria sinensis) was one of the best examples for a private residence in Cambridge. Wisteria look wonderful and have a magnificent smell, in common with many members of the pea (Leguminosae) family. Wisteria also grow very quickly and can be difficult to look after. This particular plant was over 20 years old in 2000, and was maintained with the aid of the gardeners of Jesus College. In the Spring of 2006 it did not flower very well and it was cut down and it seems that it had been poisoned from some drain underneath.